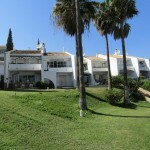 Las Chapas is a residential area located between Cabopino and Elviria. Search here for properties for sale in Las Chapas Marbella. Las Chapas is in the municipality of east Marbella and is accessed from the N340 coast road at 192km. Málaga international airport can be reached in less than 30 minutes. The development is located 15 minutes drive to the east of Marbella town (approximately 10km) and is close to the Cabopino to the east and Elviria and Rosario to the west. It is a recently developed small community, which is essentially purpose built as a beachside residential area.The beach is approximately 1.000m long and 40 m wide and is made from fine golden, dune type sand. Among the amenities, there is a campsite and four beach restaurants. The beaches in the area are often thought to be the best in Marbella and most properties have been built within easy walking distance to the beach. One can walk to Los Monteros and on to Marbella to the west or the picturesque Puerto Cabopino to the east.